Did you know that hundreds of church burnings have taken place all over the globe so far in 2011? For a large percentage of those of you that are reading this article, this is the first that you have heard of it. And do you want to know why? News stories about church burnings and the persecution of Christians around the world are not “politically correct” enough to get into the mainstream media most of the time. Have you ever noticed that an overwhelming percentage of news stories about Christianity in the mainstream media are negative? There seems to be an unspoken rule that you should never report on anything that would portray the Christian faith in a positive light – even if it is reporting on how churches are being mercilessly burned to the ground. Others fear that reporting on church burnings would somehow justify the endless wars in the Middle East. But the truth is that many of the regimes that the U.S. government has put in place or is propping up are actively involved in the persecution of Christians. Whatever religion you belong to, and whatever your political philosophy is, we should all be able to agree that church burnings are evil. If you cannot agree that there is something wrong with burning churches to the ground then something is wrong. In the United States, our founding fathers established “freedom of religion” as one of our fundamental rights. Many of our founding fathers had escaped horrific religious persecution in Europe and many of them knew firsthand how insidious it can be. Today, hundreds of churches around the world are being torched. I am a Christian and I am not going to be ashamed to shed light on these great crimes. If you don’t like that, then maybe you should ask yourself why that is the case. The following are just a few examples of the widespread church burnings that we have seen so far this year…. In the aftermath of the U.S.-backed “Egyptian revolution”, church burnings have become a regular thing all over Egypt. The recent burning of a Coptic church right in the middle of Cairo has plunged the provisional government in Egypt into crisis mode as a recent article in The Telegraph noted…. Egypt’s caretaker government has held crisis talks after attacks by Muslim mobs on Coptic Christian churches in Cairo left at least 12 people dead and drove the country’s growing religious tensions to the brink. The following is the kind of video footage that is very rare to see on U.S. news programs. This footage is of Saint Mary Church in Cairo burning wildly after it was firebombed by Egyptian radicals on Saturday…. Can everyone agree that this is wrong? Unfortunately, this is not just an isolated incident. Christians in Egypt now must watch out for attacks every single day. This latest round of violence against Christians really got going back on New Year’s Eve when 21 people were killed and 43 people were injured when a massive bomb went off outside a Coptic church in the city of Alexandria, Egypt. That attack was so horrific that it actually did get a little bit of attention in the U.S. press. Egypt is spinning out of control and the horrific persecution of the Coptic Christian minority (about 10 percent of the Egyptian population) is rising to frightening levels. Earlier this year there was an attack during which an estimated 4,000 Muslims violently assaulted Christian homes and burned a church in the Egyptian town of Soul which is about 18 miles from Cairo. What would you do if there was a mob of 4,000 people rampaging down your street looking for Christian homes to burn? Egypt used to be a fairly stable place, but unfortunately that is now no longer true. It has become incredibly difficult to be a Christian in the nation of Pakistan. Church burnings and physical attacks on Christians have become commonplace. The following is how an article posted on Asia News described the recent problems in one particular province…. Tensions are running high in Gujranwala, a town in the Pakistani province of Punjab, recent scene of repeated attacks by Muslim extremists against the Christian minority. Yesterday, a mob attacked Christian homes and places of worship, setting fire to a number of churches. Only the action of police prevented any loss of life and injuries. 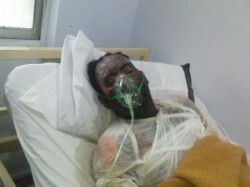 For some Christians in Pakistan, the persecution goes far beyond just having a church burned down. For example, one Pakistani Christian named Arshed Masih died after radical Muslim leaders, backed by police, burned him alive for refusing to convert to Islam while his wife was raped by police officers. This incident, which took place on March 19th, 2010 is just another example of how horrible things have become for Christians in Pakistan. In Ethiopia, dozens of churches are being burned. The international media is reporting that 69 churches in a single Ethiopian city were burned just in the month of March alone. How would you like it if an angry horde came into your town and burned down all the churches? The following is how Radio Netherlands describes what has been going on in Ethiopia …. Evangelical churches and homes of Christians in Asendabo, about 300 kilometers southwest of capital Addis Ababa, and other towns in the Jimma region were torched earlier this month. Thousands of them have fled their hometowns to safer areas. More than 46 churches belonging to the Pentecostal Kale Hiwot (Word of Life) Church and 23 belonging to other Christian groups have been burnt down, says Temesgen Wolde, coordinator of the Kale Hiwot department in Jimma City. His church shelters eighty refugee Christians in a tent. In Nigeria, hundreds of church burnings have been reported so far this year. Many of them took place after the Christian candidate for president defeated the Islamic candidate for president back in April. Thousands of Christian homes and businesses were destroyed and nobody is sure how many Christians were actually slaughtered. The following is how an article posted on FRONTPAGEMAG describes what went down…. Angry that Christian President Goodluck Jonathan defeated Muslim candidate Muhammadu Buhari, Islamists in the Shariah-ruled north began rioting on Monday, April 18, 2011, after preliminary results of the April 16 election were announced. Soon newspapers featured grisly photos of charred bodies lining the streets. Hundreds of churches were burned and thousands of Christian-owned businesses destroyed, according to the Christian human rights group, Open Doors. And International Christian Concern reported that the Kaduna-based Civil Rights Congress was still “discovering more details of massacres that have been carried out in the hinterland.” Upwards of 40,000 Christians have been displaced in the past few weeks. But did you hear about any of this in the U.S. media? Perhaps there was a “blip” or two about the “election violence”. Instead of focusing on real issues, our media at the time was absolutely obsessed with promoting U.S. military action in Libya. The truth is that the U.S. government and the U.S. media have never really shown much concern for the good people living in places like Nigeria, Ethiopia and Sudan. For years and years, countless thousands of Christians in Sudan were being slaughtered by government-backed forces and countless thousands of Christians were actually being sold into slavery, and yet our government did nothing. But then a handful of people died in a revolt against the government in Libya and our government “was forced” to act for “humanitarian” reasons. The U.S. government does not really care for the people of Africa but the truth is that those people are just as valuable as anyone else. When we see churches around the world being burned down we should care just as much as if churches in the United States were being burned down. Persecution of Christians in the United States is growing too. Not only that, there is no record of anyone ever complaining about it. But he got suspended anyway. You see, the truth is that the word “Jesus” has become a dirty word in the United States today. Just try saying it (not as a curse word) at school, at work or at a public event some time. One U.S. Navy chaplain even had to face a court-martial for standing up for the right to pray “in Jesus name” in the U.S. Navy. So, no, this is not a “politically-correct” article. But you know what? Since the founding of this nation a whole host of our countrymen have bled and died to protect our basic freedoms. One of those freedoms is the freedom of religion. When there is an attack on the freedom of religion we should all be alarmed because it is an attack on all of us. If you say that you love liberty and freedom, you should be against the persecution of Christians wherever it is found around the world. Are You Addicted To Bad News?